New 16HP V-Twin versions, give you increased power and reliability, a new exhaust system has been fitted to reduce sound emissions and to facilitate smoother operation. A durable floating skirt is positioned within the machine body for greater protection and works to contain the leaving the floor dust free. And the fully adjustable handle folds down to reduce the total height to 850mm making transport easy. For maintenance and serviceability there’s easy access to belt and drive system eliminating costly and unnecessary down-time. The push button 12-volt battery starting system facilitates easy starting every time. A bias control allows the machine to be aligned to prevent any sideways drag, making this burnisher a dream to use. Maximum floor contact is achieved with the use of the Rubbermaid pad holder. It is designed to follow the contours of the floor surface while maintaining a consistent 50cm burnishing path. The ergonomically designed handle is adjustable and is fitted with a throttle control which is located at the operators fingertips. The handle can be folded down for shipping and easy transport. The metal base of the propane burnisher is powder coated and offers long life and durability. It is also fitted with a full wrap-around bumper for added protection. All gas bottles, hoses and fittings are in accordance with safety standards. Honda Propane Gas Powered 13 HP 4 Stroke Overhead valve with oil alert. 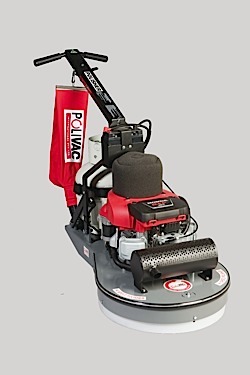 Propane-powered floor burnishers have been gaining popularity since their introduction in the late 1970s. Their chief advantage lies in their horsepower, which when combined with their high speed translates into significant labour savings and increased productivity when compared to electric or battery-powered burnishers. 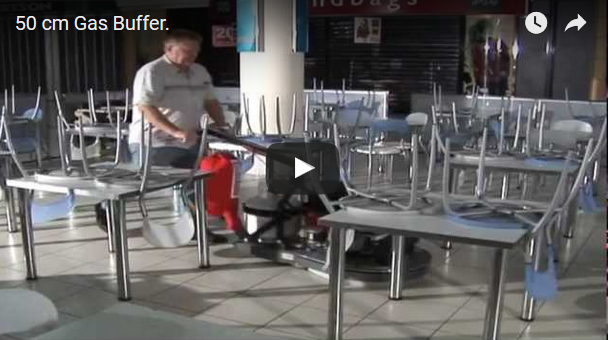 Industry experts estimate the cost of labour to produce a cleaner floor has been reduced by as much as 600 percent over traditional swing buff cleaning methods. Alongside the development of Gas burnishers has been the introduction of new chemical processes and combinations that give floors a high gloss and glassy "wet look" or mirror finish, which is now the accepted benchmark in the cleaning industry. However, the problem with traditional electric or battery-operated burnishers is that they just don't have enough RPMs to buff floors to a hard, resilient thermoplastic finish, the way a gas machine can.